I wish I could remember the first time I had burrata. It's been a favorite of mine for years, but I can no longer pinpoint the first time I cut my fork into the creamy ball of luxury. 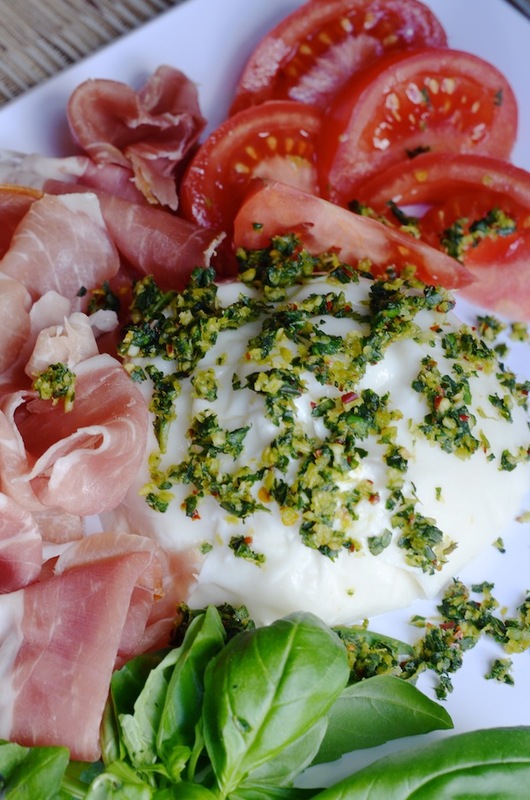 Burrata, if you've never tried it, is simply fresh mozzarella cheese that has been stuffed with a mix of thick cream and shredded mozzarella (itself called stracciatella, which means "shreds"). Best eaten fresh, ideally within 24 hours, if not sooner, it's absolute heaven for those of you who love mozzarella. I've had burrata in just about all the ways you can have it--in a salad, relaxed onto a pile of lightly dressed greens and cherry tomatoes. Divided into small pieces on top of a hot, slightly-charred pizza, fresh out of the brick oven. And--most often--on its own, warmed a bit to room temperature and drizzled lightly with olive oil. If it's on the menu, I order it. And if I see it in the dairy case, it makes its way into my basket. And unless I'm explicitly serving it as an appetizer for the table, don't you dare eye my burrata. I hate sharing, and will possessively hold my bowl close to me as I savor each bite. There have been several occasions where I've served Eugene one thing for dinner, and then come out with my own personal little bowl filled with nothing but my ball of quivering cheese. "What?! Why do you get to have that?" He'll ask, suddenly dissatisfied with his pasta or chicken or whatever it is I served him. Because the beauty of being the one who shops and cooks, is that you get to have whatever you want. This recipe for Burrata topped with Spicy Basil Gremolata was inspired by a salad I saw on Nigella Lawson's site. 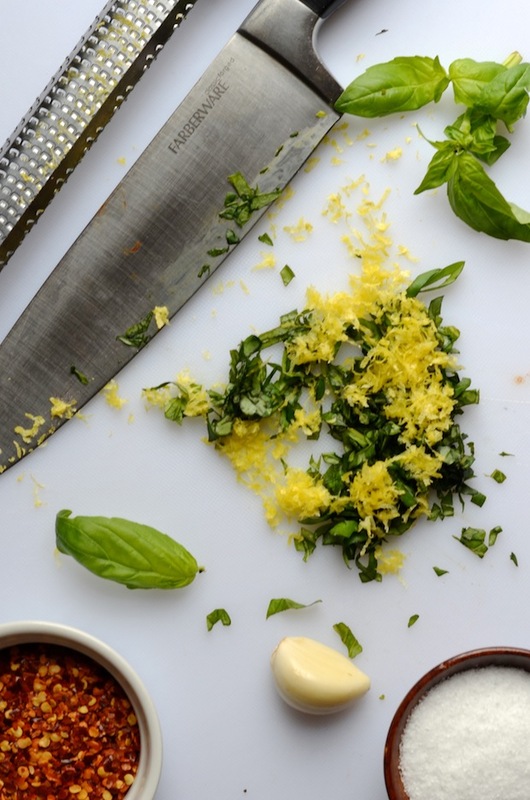 Gremolata is an Italian condiment made with finely chopped parsley, garlic and lemon zest that is typically served on ossobuco or roasted chicken. Nigella kicks her version up with chiles and olives and all sorts of things (she calls it "crazy gremolata") to serve on a regular mozzarella salad, but I did things a bit differently. I swapped the parsley for basil, and added red pepper flakes for heat. It's wonderful sprinkled loosely on the cheese (which you MUST take out of the fridge at least an hour before you serve it--it's got to lose the chill a bit for you to really enjoy it), and served alongside crusty bread, ripe tomatoes, and thin slices of prosciutto. It's a fantastic appetizer, yes, but makes an even better lunch. Optional accompaniments: fresh tomatoes, bread, prosciutto, etc. Stack basil leaves on top of each other on a cutting board, and chop coarsely. Add the lemon zest and garlic to the pile, then continue to go over the mix with your knife to combine everything into an even mince. Add the red pepper and the salt, mix up and set aside. Place burrata on a plate and top with gremolata mix. Serve with bread, fresh tomatoes, prosciutto or other garnishes, as desired.